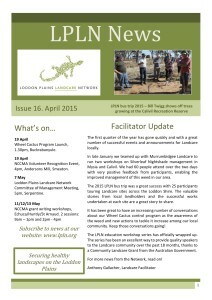 The Loddon Plains Landcare Network releases an online newsletter called the LPLN News. The newsletter is prepared by our Landcare Facilitator and contains information on events, field days and grant opportunities coming from the Network. Past newsletters can be downloaded below. For more information or to register an article or event for the next edition, contact our Landcare Facilitator.